To begin this tutorial, first we must draw a template or print one out in the size needed for our project. 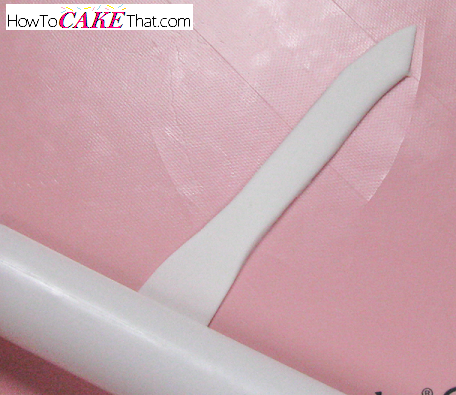 Cover the template in clear masking tape on both sides to protect the paper from moisture. To make it easy on you guys, I have included my template for you to download for free!! Click Here To Download. The template is copyrighted. Feel free to use decorations made from this template on personal cakes and cakes you are selling. The copyright just means this template itself should not be shared on other websites. Next, cut out your template. Knead together a mixture of 50% fondant and 50% gum paste. Color the mixture with gel food coloring. 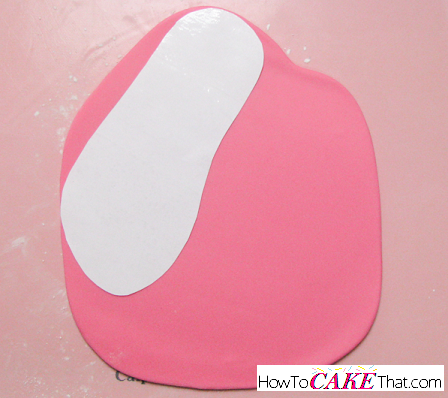 Dust work surface well with cornstarch and roll out fondant mixture to desired thickness. 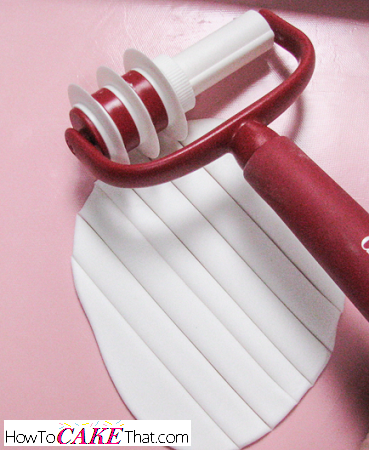 Allow fondant to sit for at least 15 minutes before proceeding on to the next step. 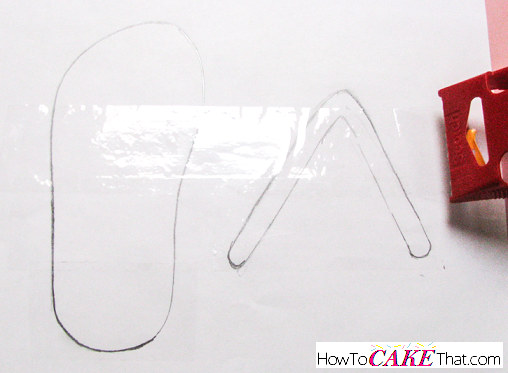 Gently trace around the flip flop template with a razor or Xacto knife to leave a light outline mark. Remove the paper template and trace over the outline again. This time be sure to cut all the way through to cut out the sole of the flip flop. 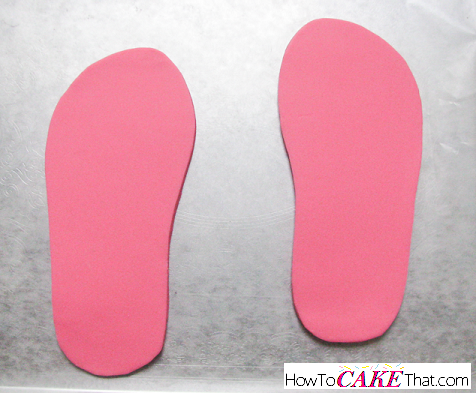 Cover a flat surface with wax paper and place the flip flop sole on the wax paper and allow to dry overnight. After flip flop soles have dried overnight, it's time to add the "toe thong" piece. I used a lollipop stick cut down to the length needed. Lightly dip one end of the lollipop stick in water and gently insert the wet end of the lollipop stick piece into the sole of the flip flop. 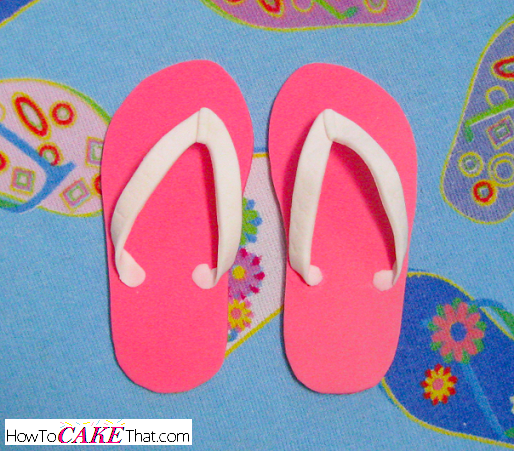 While the lollipop sticks are drying in the soles of the flip flops, it's time to make the flip flop straps. Set ribbon cutter disks to the size closest to the paper template size. 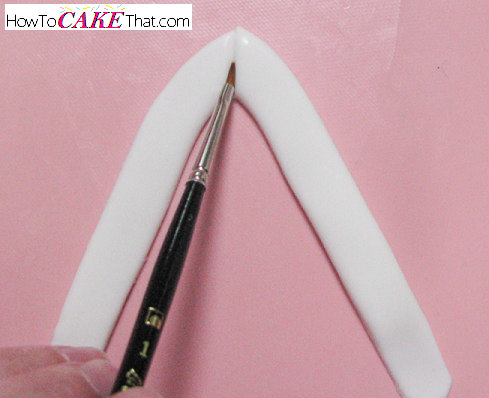 Using a blend of 50% fondant and 50% gum paste (or a mixture of fondant and tylose powder), roll out to desired thickness. Using your ribbon cutter, cut out straps... two for each flip flop. 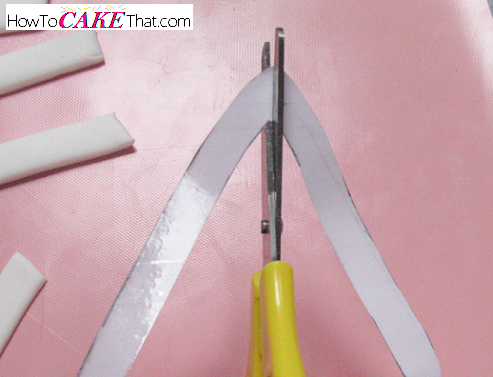 To make shaping this "V" piece easy, cut the paper template in half at the bottom of the "V" to make two pieces. 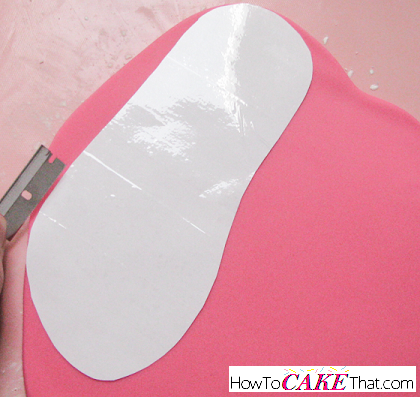 Next, lay out a strip of the cut fondant. 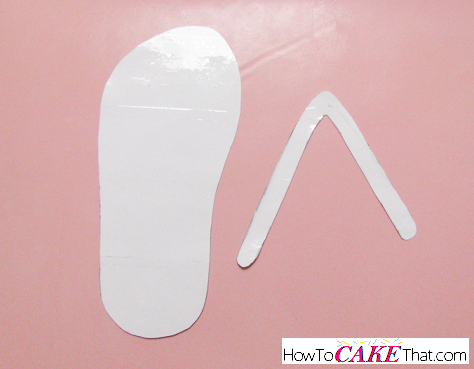 Lay half of the paper strap template over the strip of fondant and shape the fondant underneath so it matches the shape of the template. 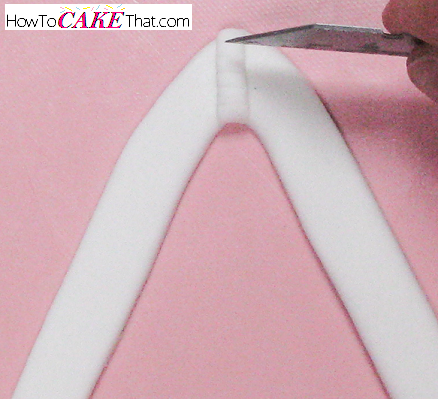 Trim the fondant to size. 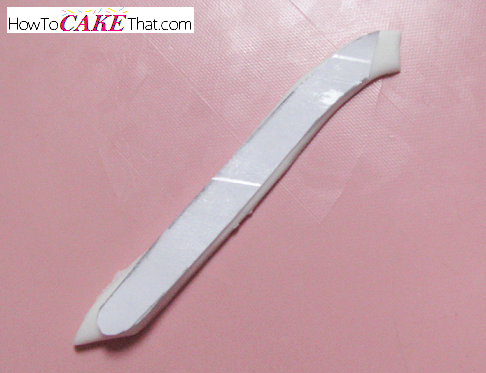 On the end of the strap that will sit closest to the heel, thin it out a little bit using a fondant roller. Lay paper template back over the strap and trim to size. Repeat these steps with the other half of the "V" template. 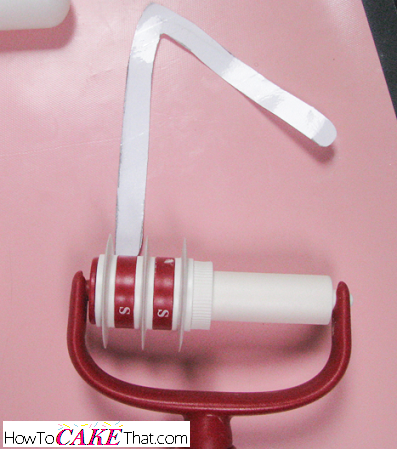 Join the two halves together by bringing together the two thick ends of the "V" strap and lightly painting the seam with water. 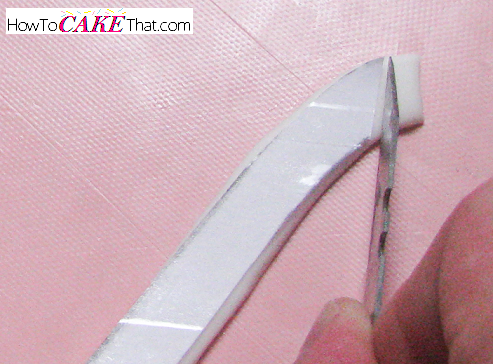 Next, lay a small piece of fondant over the seam and create small line marks using a blade or knife. 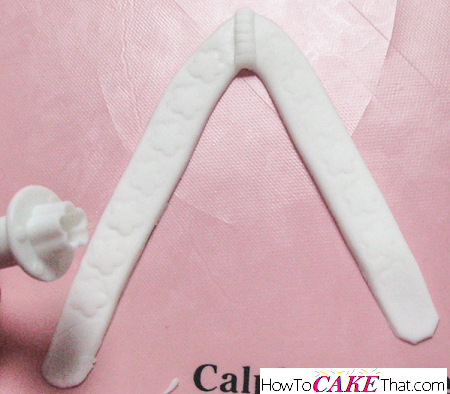 To give the straps a fun design, I very lightly pressed a flower cutter into the fondant. Allow straps to sit and dry for at least 10 to 20 minutes before attaching them to the sole. Do not let them get so dry that they crack. The should be a little firm, but still flexible. Once the straps have hardened a little bit, it's time to attach them to the sole of the flip flop. To do this, lightly brush the end of the lollipop stick with a little water. Then place a tiny ball of gum paste onto the end of the lollipop stick. Brush the tiny ball of gum paste with water. 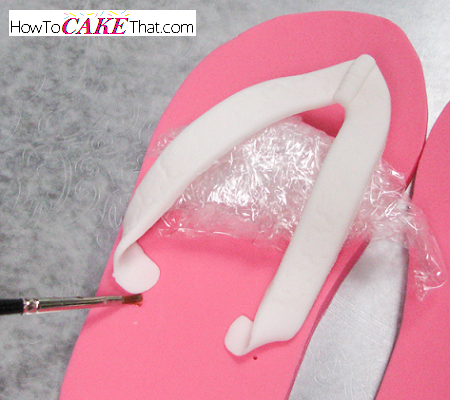 Also place a ball of plastic wrap (or other material good for holding up fondant pieces) on the sole of the flip flop where the straps will need to be held up. 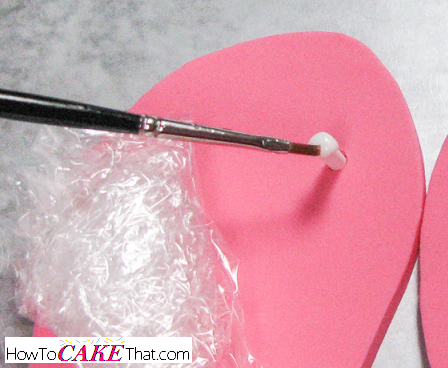 Lay the fondant straps over the lollipop stick and the ball of plastic wrap. 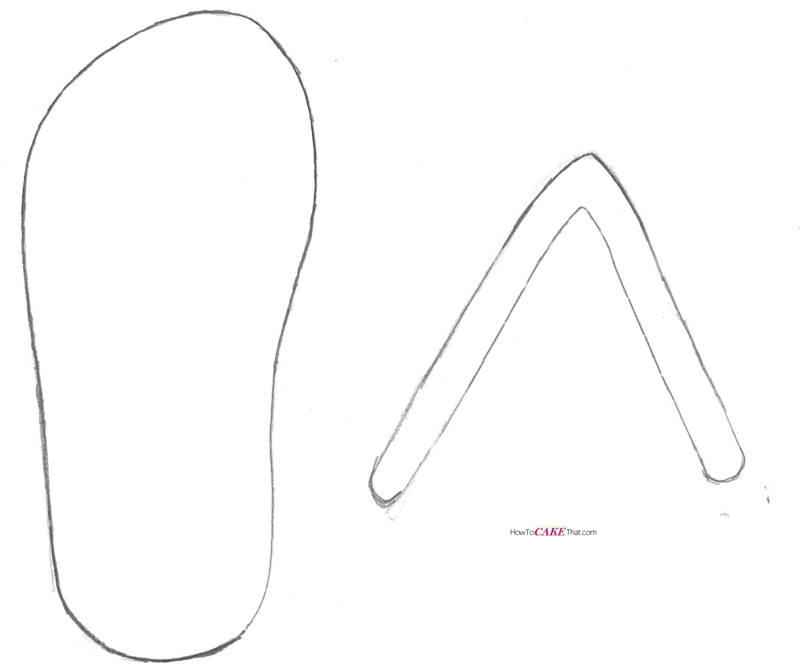 Twist the strap ends so that the top of the strap is face down onto the sole of the flip flop. Brush where the strap and sole meet with a little water to glue them together. Allow flip flops to fully dry. This may take several days. And that's how you make edible flip flops! 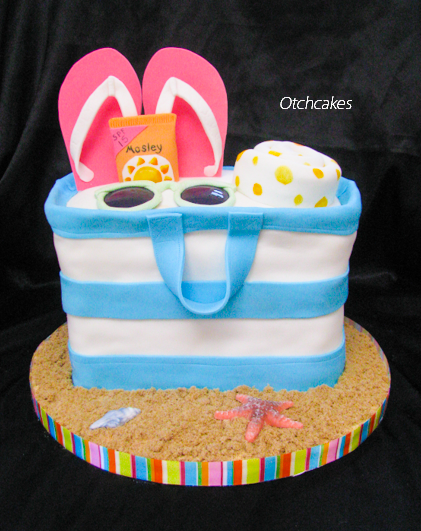 A summer beach bag cake wouldn't be complete without a pair of them!! I hope you have enjoyed this tutorial! God bless!